Is your combined monthly debt so high that you can't afford to pay your mortgage, utility bills, and car payment? If so, a debt relief lawyer might help. These legal professionals specialize in relieving the debt problems of their clients. And while hiring one won't make your money problems magically disappear, it could be the first step to easing your financial pain. Hiring a debt relief lawyer should not be a quick decision, though. These attorneys usually don't work cheap. 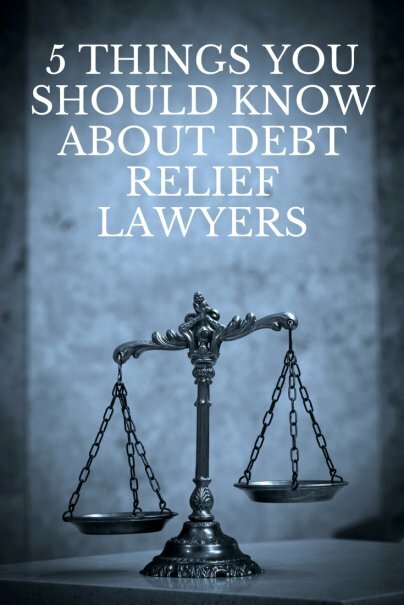 Here are five facts you need to know about debt relief lawyers, how they operate and how much working with one will cost you. Debt relief lawyers take on a number of tasks for their clients — tasks that will vary depending on how much debt these clients face. An attorney might negotiate with credit card companies, auto lenders, and other creditors, hoping that these creditors will forgive some of the debt their clients owe. They might work with creditors to set up a payment plan in which their clients only pays an amount that they can realistically afford each month. In more severe cases, debt relief lawyers will help their clients negotiate the bankruptcy process, helping them close either a Chapter 13 or Chapter 7 bankruptcy filing. If you and your debt relief attorney determine that bankruptcy is the best solution to your debt woes, you'll then have to decide whether to file for Chapter 7 or Chapter 13 bankruptcy. In a Chapter 7 bankruptcy filing, most of your unsecured debt is simply eliminated. Because most debts disappear, many consumers facing debt problems prefer this type of bankruptcy. But a Chapter 7 bankruptcy isn't pain-free. You might lose some of your most valuable assets. Say you have a car, the bankruptcy trustee — the individual who is overseeing your bankruptcy on behalf of the court in which you file — might order that car sold. The profits from the sale would then be passed out to your creditors. In a Chapter 13 bankruptcy, a judge sets up a repayment plan that allows you pay back your creditors at a pace and payment level that you can afford. Depending on your bankruptcy agreement, you might have to pay back less than what you owe, but your debts won't be eliminated. You'll have to pay at least a portion of them back. On the positive side, you will be able to keep your possessions — such as a home and car — during a Chapter 13 bankruptcy filing. Debt relief attorneys can provide you with a way to ease the burden you face because of your debt. But even if you work with one to file for bankruptcy, they can't magically make all of your debts disappear. The National Association of Consumer Bankruptcy Attorneys says that bankruptcy, even Chapter 7, won't eliminate student loan debts, alimony debt, tax debt, and any debt obtained through fraudulent activities. Working with a debt relief attorney to file for bankruptcy could leave you with a fresh financial start. But it won't come without consequences. Both Chapter 13 and Chapter 7 bankruptcy filings will cause your three-digit FICO credit score to plummet, often by more than 100 points. This is significant because lenders rely on this score to determine who qualifies for mortgage, auto, and personal loans. They also rely on the score to determine the interest rates they charge to borrowers. If you have a low score, you'll be stuck with a far higher interest rate, which will make your monthly payment higher, too. The negative pull that bankruptcies have on your credit score will lessen over time. If you pay your bills on time each month, your credit score will gradually recover. Doing so, though, can take years. Even worse, bankruptcy filings remain on your credit report for a long time. A Chapter 13 bankruptcy filing will remain on your credit report for seven years. A Chapter 7 filing will stay there for 10. Every time a lender pulls your report during this time, it will see your bankruptcy filing. How much a debt relief attorney charges you depends on the amount of money you owe and what services this lawyer tackles on your behalf. The legal website Nolo says that you might spend from $700 to $2,500 if your debt relief attorney files Chapter 7 for you, but $2,500 to $6,000 if your attorney instead has to file a Chapter 13 bankruptcy on your behalf. If you are paying an hourly fee for the services of a debt relief attorney, you can expect to pay from $125 to $350 an hour, according to Nolo.